Hello everyone, I hope you're all having a great week. I'm really looking forward to the long weekend here in BC as it will give Chase and I time to work on renovations and settle into our place. We also have the annual Rodeo going on, but we most likely won't attend this year just so we can use that time for renovations and what not. I use to have this super cute denim jacket back in the day that I literally wore all the time. So when I came across this light fade denim vest from Dynamite the other day, I was excited to have it in a vest versus a jacket. I mean who doesn't love a cute denim vest to add to their collection?! If any of you lovely ladies need some new denim, definitely check out Dynamite tomorrow as they have partnered with The Cure Foundation to raise funds and create awareness for Breast Cancer through the foundation's National Denim Day campaign. Tomorrow is the last day of the Dress in Denim campaign, so head over and stock up on denim! 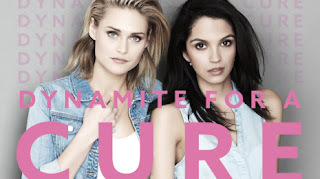 From every in-store purchase of denim clothing Dynamite will donate $1 to the Cure Foundation. hey sweetie! this denim jacket looks amazing with that striped dress (and wow, you have the most gorgeous figure ever) and i think you're going to get tons of wear out of this during the summer months. great find! I love this whole outfit, Elizabeth. Looks so comfy and so effortless. You look so beautiful in this! All of these pieces are so versatile, which I love haha. Yay for the long weekend too!! That's a really great cause Dynamite is having too. Enjoy your weekend! Thank you Amanda. Long weekend was great, well it always is haha! Got a lot done so pretty happy about that:-) Hope you had an awesome weekend. Hi! This is such a comfy looking outfit! Red and blue remind me of summer in France :) and I love a cute denim jacket as well to pair op with a maxi dress! You look great! Thank you Josune. It would definitely look beautiful with a maxi dress also! Love that. I want to try and get more maxi dresses this summer. That's great to hear Gabrielle! Thank you so much:-). I really love these gold sandals, but unfortunately they aren't so comfortable... took them to Mexico and they kept digging into me. Think I need to take them back to Nordstrom to exchange for another pair. Love your outfit, really fresh and perfect for summer! Thanks Brooke! We did actually:-) It was really nice to come across a vest as I've always gravitated more towards a jacket. Gorgeous outfit. I love stripy dresses. You look great! I wish I could pull off a denim vest half as well as you do! That's also a wonderful campaign Dynamite is promoting. This dress looks perfect on you! Loving this vest as well. Love the dress & purse! You have GORGEOUS eyes btw! This outfit is too cute! I love your striped dress and jean vest!